Analytics is one of the most important factors in determining your reach as an artist today, from websites to streaming platforms, album sales to music video plays, it has become a central point for many trying to find their audience. For Jesper Skibsby, an idea came when managing a band and thinking about an analytical tool that could offer transparency for radio monitoring. 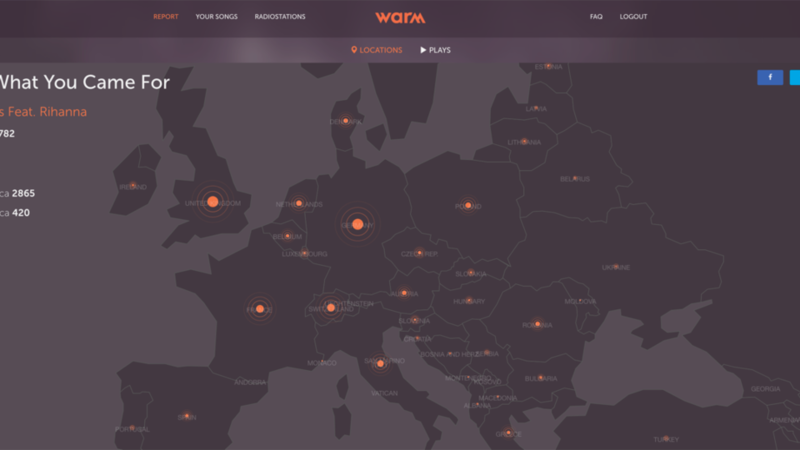 WARM is the end product of Jesper’s search for a service that could monitor radio play of an artist’s track; “It is like a Swiss Army Knife” he opens, “you can control reports before sending out to your label, booking agent, getting real-time statistics”. Jesper is joined by CIO Kristoffer Jensen or “the IT Translator” as he nicknamed, and Head of Communications, Sherin Almajid. Both Kristoffer and Jesper met by chance at a football match when their favourite team was in the cup final. They had a lot of mutual friends but had never met each other until then. The pair have been working together for the past year on the project before Sherin joined in May of this year. WARM’s business model is straightforward, they offer a free one month trial to monitor one song. After that, it is a €5 per month/song. For those who stick with the platform, there is a flat fee of €36 to monitor one song for the duration of a year, with the ability to change the song once a month in that period.